Ardwold was the home of Sir John Craig Eaton and Lady Eaton - the name means "high green hill" in gaelic. Built in 1911, it was demolished (some of the thicker walls requiring dynamite) only 25 years later in 1936. By all accounts it was one of the most dramatic houses in all of Canada, second only to Casa Loma next door. The land was purchased in 1909 and the existing home, Anne Arthurs's Ravenswood (1867-1909) was torn down. 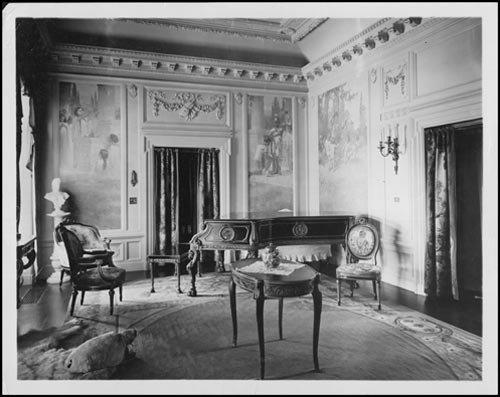 Architect A. Frank Wickson then designed the 50-room Georgian style estate, which included the expected music room, billiards room, and 14 bathrooms. But the house also included an elevator, a 5-room nursery suite complete with its own kitchen, a private hospital area, and an underground tunnel to the half-acre glassed in conservatory and indoor swimming pool. But guests were first introduced to the mansion in the two storey great hall complete with a pipe organ that Sir John would often play. As with many estates along the escarpment just above Davenport Road, the 11 acres of gardens and grounds at Ardwold were noteworthy as well. The view south over Toronto was enhanced by the formal Italian-inspired gardens and fountains. Unfortunately the Ardwold estate was sold in 1936 after Sir John died of pneumonia in 1922, and Lady Eaton moved to her King City chateau. The land was divided up into what is now the Ardwold Gate subdivision. Ardwold is just one of the many estates that have stood along "The Davenport Hill" in Toronto.